I am again running late. 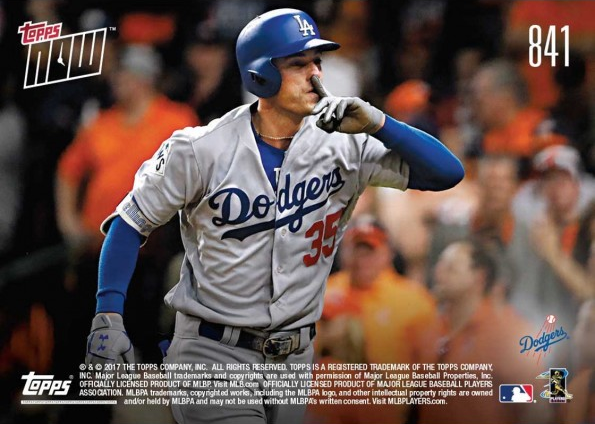 Featured here are the newest Dodgers' Topps Now cards made available yesterday afternoon. 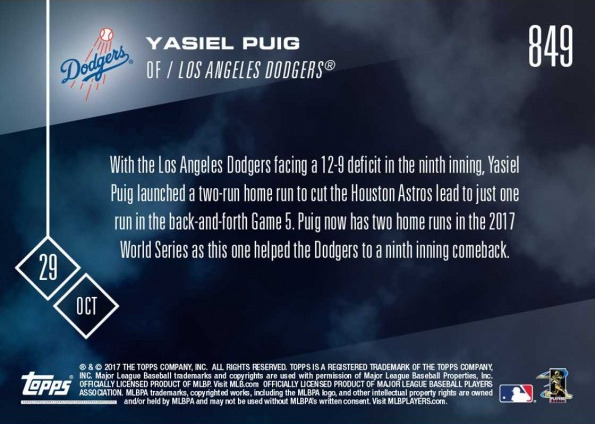 They all relate to Sunday's thrilling, yet disappointing loss to the Astros in extra innings. First up is a Cody Bellinger card highlighting his fifth inning three-run home run to give the Dodgers a short-lived 7-4 lead. Go here to check it out and order. 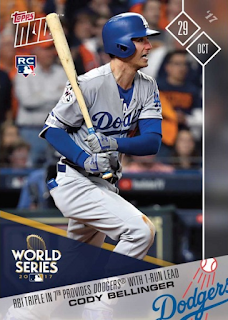 Following that is a second Bellinger card. See it below. "Mentally exhausted right now," Bellinger said at his locker following the Game 5 thriller. "That was the craziest game I've ever been a part of, probably ever will be a part of. And got to tip your cap, they never gave up and we never gave up. We're determined. And this thing isn't over yet. We've got a bunch of resilient guys in here and we're going to come out in full force." "My team, this is not going to be finished Tuesday. 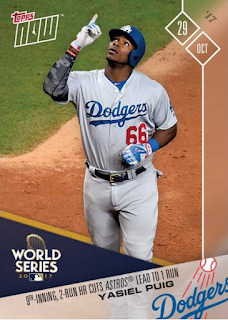 There's going to be a Game 7," said Puig, whose two-run homer helped the Dodgers send this wild one into extra innings with a three-run ninth. 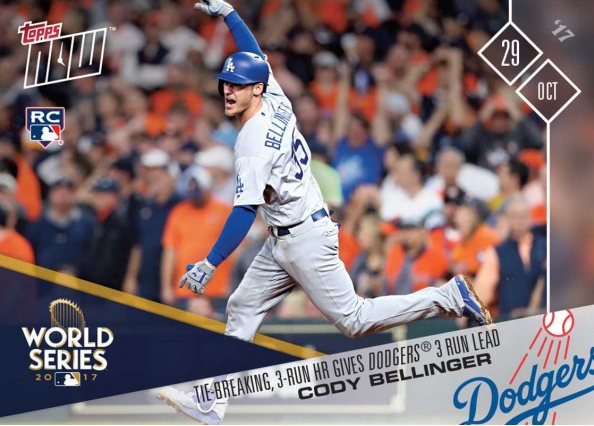 "All the fans in Los Angeles from the first day of Spring Training, and the team, do a lot of workouts and preparation, and this is the reason my team is in the World Series right now. And I want to say thank you to the fans for supporting my team on Tuesday, and there's going to be a Game 7." Chris Taylor followed up on Yasiel Puig's two-run home run with a RBI single to complete the Los Angeles Dodgers ninth inning comeback as they tied the game at 12. 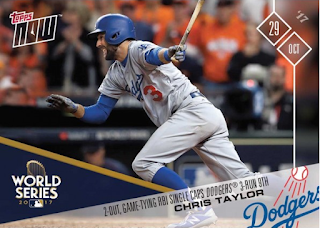 Taylor was down to his last strike before he struck gold for the Dodgers with his RBI single to score Austin Barnes and complete the Dodgers three-run ninth inning.